Thought I would “slide” a quick post in on a cold and blustery day. Get it? “Slide”. The Electric Slide done to Marcia Griffiths Electric Boogie? Anyone……Bueller, Bueller? So it’s not that funny/clever/witty!? So what!? If I humor myself that’s good enough for me. Btw, I got to see Marcia Griffiths in concert back in the late 80’s early 90’s when I was doing my college reggae radio show at the College of Wooster. Very fun. Anywho, this is a companion post to my service panel post/video from January. (Electric slide, post on electric? Enough already, Travis! I’m getting cabin fever from this crappy winter weather, I digress.) This post was prompted by the ice storms we had at the beginning of the week. During my home inspections I occasionally feel as if clients and realtors think I am being picky about certain things. I pride myself to be a home inspector who puts things in perspective and will emphasize things that are truly important. One particular thing is your electric service wire (The big thick usually gray wire) that runs from the electric pole to your house and then down to the meter IF you have an overhead service. This is usually run to something called a weather head and wired into a drip loop before entering the said weatherhead, running down your house and going into your meter. The drip loop is there to keep water from running down the line, into the weatherhead and down the line into your meter and possibly into your house to the electric panel inside. Hence the term “drip loop”. It lets water drip off. Riveting stuff, I know. But what I want you to take notice of specifically is the wire that runs down your house to the meter. 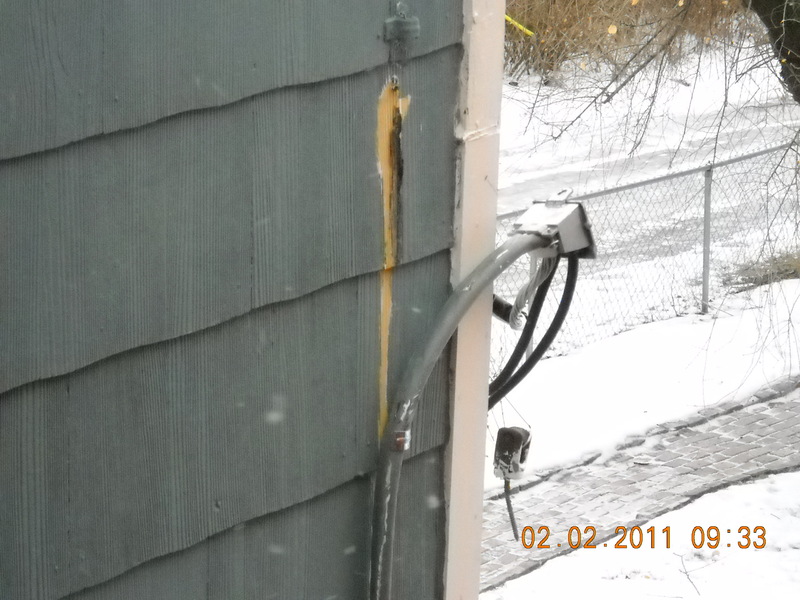 This wire needs to be clamped to your house about every 3 feet or less from weatherhead to meter. I can hear you now, “Why is this a big deal, T?” (My friends can call me T and as a reader you are now a default friend. We’re sharing special moments here, bonding even!) Let me do better than to tell you why it is important, I will show you how having it properly clamped can be very helpful with a couple of pics from my neighbors house. The weatherhead was pulled of the house by the weight of the ice on the line and the clamp held it from falling. The weight of the ice pulled the weatherhead loose. If the wire wasn’t clamped properly it would have either left a live electric line laying across their back yard (Not good despite what you might think!) or disrupted their electric service to the house in the middle of winter for a few days while AEP tried to get over here to fix it (Also no fun.). 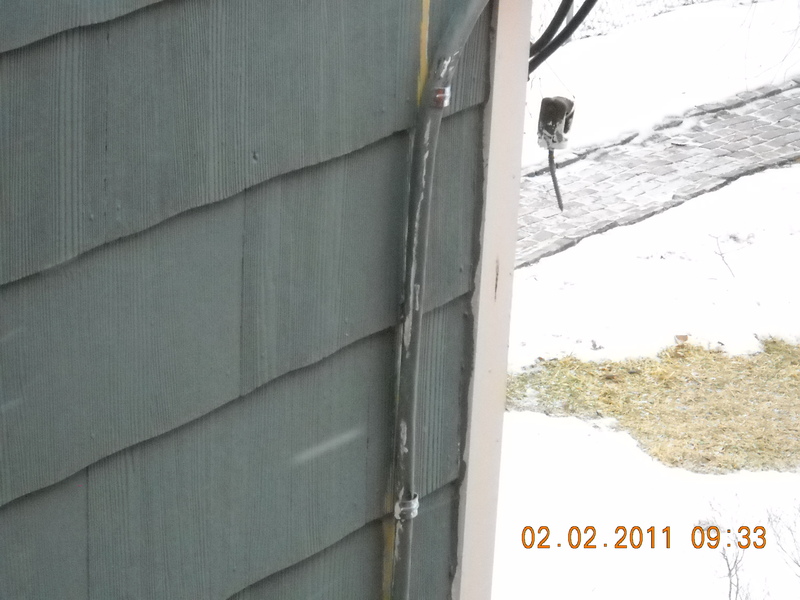 A pic of the clamps holding the service wire to the house. Now I know my readers in the warmer climes (Yes, I kinda don’t like you right now but don’t take it personal. It’s more weather related.) are thinking that this doesn’t matter to them but au contraire mon frere, it does. Take out “ice storm” and insert heavy winds/tree branch/weatherhead pulling loose due to age/etc. So next time you’re outside, check it out. It doesn’t hurt, heck, it isn’t even painful. 😉 That’s it for now, just a little FYI. Soon to come will be a tool spotlight and a post on replacement windows if you so choose to replace yours.